There have been a few calls for a final blog, people asking if we are going to confirm that we are home and wrap it all up. A quick look at the last blog we wrote and incredibly that was nearly four months ago. So, without further ado, here it is – the final blog. Once Adina was on her way home, to warm-up for our return to the big smoke that is London, our home, we stopped in New York to visit Susie’s cousins Sarah and Simon who live there in Brooklyn. Susie has always liked New York, Tom a little less having only stayed centrally in Manhattan on previous trips. After five days we were hooked, we wanted to live in New York. Such a shame the Americans aren’t more generous with their green cards. Heading on to London Heathrow, were we greeted by family and friends and big ‘Welcome Home’ banners? No, not a sausage. We carried our bags and caught the humble tube to the Plume family home. To be fair, we arrived back on what the Senior Plumes probably consider their busiest weekend of any year – the weekend of the great Scout Jumble Sale. We had debated arriving after the weekend to stay out of the way but felt we should chip-in and so the afternoon of our arrival we found ourselves working away in a muddy field. On the upside, we did get a good lamb roast as our reward. Getting used to wearing shoes! 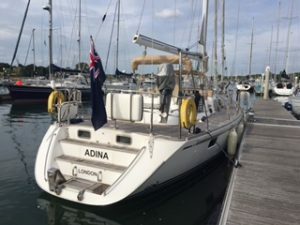 A few days later Adina arrived in the Port of Southampton. We collected her from her ship and moved her over to the lovely Universal Marina where we had based her before we left on our big trip. It felt strange and surreal to be sailing her in our home waters that we had last been on four years ago. A lot of water has flowed under her hull since that cold and misty morning on 30th March 2013 when we left Universal Marina and were heading out of the Solent, past the famous Needles. After a couple of weeks staying with the Senior Plumes starting to sort our new lives out, we headed down to Adina to get her ready for sale. As ever, our motto that if we look after her she looks after us was to be abided by. We want to hand her over to her next adventurers ship-shape and ready to go. Plus, we had to pack all our belongings up and get them off the boat! For three weeks we worked solidly only taking a day off for Father’s Day. Our plan had been to lie low and work. It was only the second day when we heard a knocking on our hull and it was friends we’d met sailing in the Indian Ocean coming by in a RIB! You really can’t hide and it was lovely to catch up in the evenings with many friends in the area. Of course, people were naturally curious as to how we were adapting. One of the many highlights of our trip was having the opportunity to share some of our tales with readers of Yachting Monthly. The magazine regularly features a ‘used boat test’; rarely having the chance to test a boat that’s been around the world, Adina was duly volunteered for testing. The editors of Yachting Monthly have been very supportive to us and always encouraged us. But we knew too that they are strict professionals and they’d be subjecting our precious baby to a thorough test. The day arrived and it was wonderful to finally meet Chris Beeson whose articles we’ve always enjoyed reading. Chris was soon beavering away inspecting everything on Adina, taking measurements here, there and everywhere, no cupboard was left unopened. That day the wind blew and the Solent was bizarrely fuller than usual of shipping making sailing and photography tricky. Somehow Adina knew she was on show and we felt she did us proud. The magazine is due out on 14th September and we’ve been told Adina is on the cover. Here’s one snippet from the article: “Build quality throughout is exceptional and she’s been well maintained.” Oh yes, you bet she’s been well maintained! Finally the day came when we hauled Adina out of the water and onto the hard. And we moved on to our next task, that of settling into Susie’s flat. It had been rented out for over five years and needs some renovation. 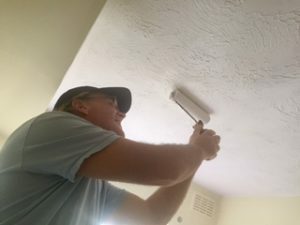 We’ll be doing that gradually over the next year but for now we’ve done the main bedroom and turned the second bedroom into an office from which this blog is written. So what next? Well, having truly learnt the meaning of “going outside your comfort zone”, we’ve decided we should stay out there and have a go at running our own businesses. For now, our focus is on getting Susie set up as a Brand Strategy consultant. Lots to do – set up the company, create a website, prepare presentations for potential clients, etc. etc. It’s what she loves, so soon we need to get out and network and find the work for her to do. 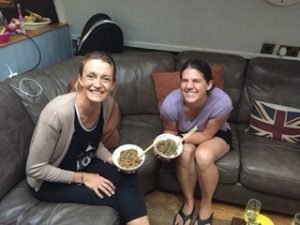 Then we have crazy ideas like a lunchtime ceviche take-away bar – we loved catching fresh fish and enjoyed learning about the different ways you can prepare ceviche as we travelled. Maybe we could translate that to London? Or perhaps something completely different selling some attractive and up-market recyclable gift wrapping in this world of excess waste. Don’t worry, we’ve not become hippies, it’s just an idea. Who knows quite where this will all be a year from now? It’s a big new world for us, we want to give it a go. There’s even talk of a new blog as we cast off for an entirely new adventure. Trim the sails hard in, let’s go. Do we miss Adina? A lovely watercolour of her painted by Ros Plume sits outside our little office so she’s never forgotten. More importantly we want Adina to have new caring owners to take her on more adventures. She took such good care of us, always strong, always reliable. And we have many happy memories that will be with us forever. Did we really do that? Wow, yes, we did! Thank you to all of you who supported us in so many ways during our trip, we are truly grateful. We were the lucky ones, we lived the adventure of a lifetime. New dreams lie ahead, much hard graft is waiting for us, challenges are bound to keep coming. Who knows, one day we may return to the sea. One thing is for sure, we will always seek out adventure in whatever lies ahead, it’s what keep us going. Splendid. Thank you so much for all your Blogs. They made great reading. Very best of luck to you both for the future. I’ve spent my commute to work reading your blogs for the last few months. 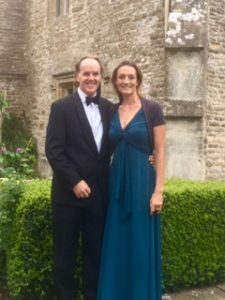 Myself and my girlfriend have really enjoyed your posts, and it’s been an inspiration as we prepare our boat for the ‘big off’ next year. If ever you fancy a drink in London, we’d love to swap nautical stories. Thank you for the blog; we have enjoyed following, and sharing in, your adventures. Well done and good luck! Good luck with the sale of your boat and best wished for the future from Norway. 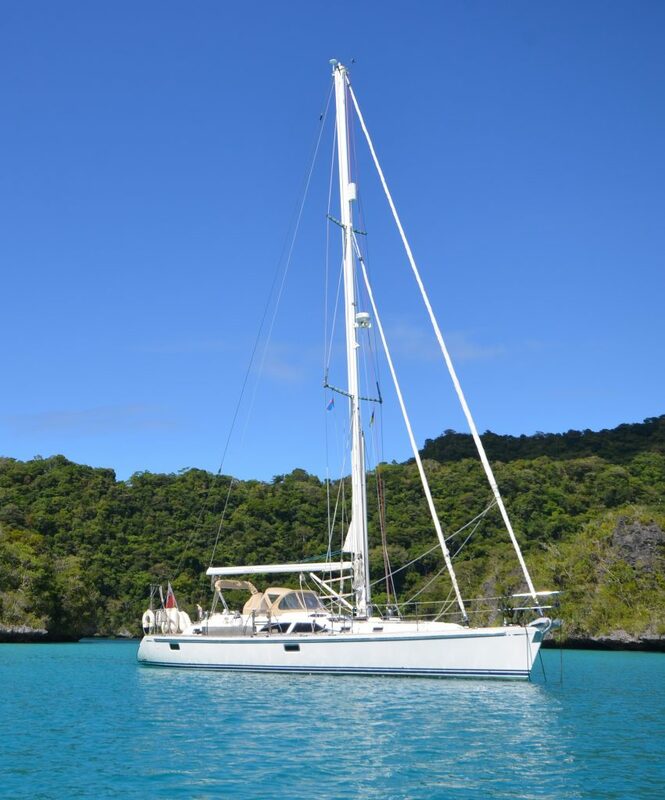 Welcome to the website of Yacht Adina and her two explorers, Tom and Susie. In March 2013 we cast off our lines with the goal of sailing around the world. This is our story.